Should You Get Achilles Tendon Surgery? Each year, 7 in 100,000 people rupture their Achilles tendons during recreational sport activities. It has been estimated that runners have a lifetime risk of Achilles tendinopathy as high as 40 to 50 percent. Here at The Center For Podiatric Care & Sports Medicine in New York City, we see at least one athlete suffering from this condition each week. We are also observing an increase in patients who tripped or slipped and sustained tendon injuries as well. To have surgery or not to have surgery: that is the question you’ll be confronted with fairly early in your treatment regimen. 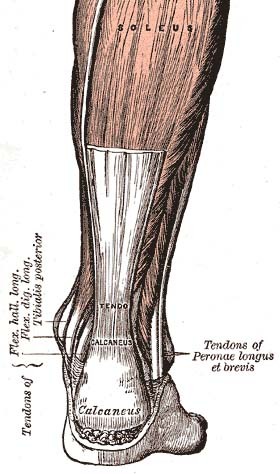 The Achilles tendon is a thick, fibrous band of tissue connecting the heel to the calf muscle. – Gastrocnemius recession – A small incision is made, and an endoscope is inserted. One of the calf muscles is lengthened, and damaged tissue is removed to improve range of motion in the ankle. There is a scant risk of nerve damage. – Debridement – If less than 50% of the tendon has been damaged, we can remove the unhealthy portion and repair the tendon with sutures. Following the repair, most patients can walk within two weeks in a cast or removable boot. – Tendon transfer – If the tendon is significantly damaged, a portion of the big toe tendon is moved to add strength in the heel. It churns many a patient’s stomach, but when all is said and done, many patients do not notice a difference in their ability to walk or run. If you are active and otherwise healthy, your sports medicine doctor will likely recommend surgery. Immobilizing the tendon puts it at a greater risk of future rupturing. One study showed a 12% re-rupture in the non-surgical group, versus a 4% re-rupture rate for those who underwent surgery. Two other studies revealed that surgery patients had better results in heel rise, concentric power and hopping exercises. Most patients will regain full strength and bounce back to all activities within a few months of Achilles tendon surgery. The recovery from Achilles tendon surgery tends to be long because the vascular system is not as dense in the feet. (Therefore, healing, oxygen-rich blood does not circulate as well in this part of the body.) It is not uncommon for athletes to take a full year before they are pain-free and back to all regular activities. There is some question as to whether surgical intervention is really necessary. A 2010 study of 144 patients found no statistical difference in operative vs. non-0perative treatment of ruptured tendons, in terms of strength or range of motion. They found one more re-rupture in the nonoperative group, but only six soft tissue complications (versus 13 complications in the surgery group). US News & World Report states that 10% of surgical patients will develop complications such as deep infection, skin death, tendon death, draining sinus, or minor skin complications. The Center for Podiatric Care & Sports Medicine can take a look at your Achilles tendon and help you choose what procedure is right for your lifestyle.